Urbanization and climate change expand the disease’s comfort zone. Aedes aegypti, the dengue fever spreading mosquito. [Credit: Panacea Biotech]. 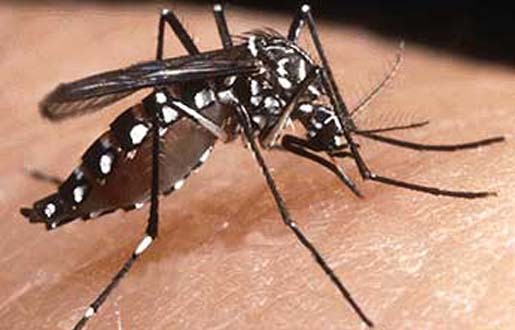 Swahilis describe the symptoms of dengue fever as “a sudden cramp-like seizure brought on by an evil spirit.” The “evil spirit” that causes this feverish sickness is a virus, which is spread by a species of mosquito called Aegis aegypti. With a taste for people and warm weather, A. aegypti habitats are sprawling as both populations and global temperatures rise—bringing dengue fever into new areas of the world. In 2002, Hales published a paper that predicted—based on geographical computer modeling—an expansion of land-areas capable of sustaining dengue due to climate change. Specifically, 30 percent of the population in 1990 lived in areas that had a significant chance of dengue transmission. Hales projected this would shoot up to 50 to 60 percent in 2085 if no other factors entered the picture. “What we would really like to know is exactly where is dengue going to happen next and exactly how many people is it going to infect,” he said. A map created by the Centers for Disease Control showing the world distribution of dengue in 2005 details how warming trends are extending the reach of the disease. Because nighttime and winter temperatures are going up at twice the overall rate of warming, Epstein explained, the virus has moved to higher latitudes and altitudes—areas usually inhospitable to disease carrying vectors—at a faster pace than projected. “Nighttime and winter temperatures [are] what really drives these things,” he said. Epstein also identified Lyme disease as another vector-borne illness that’s thriving in a warmer climate. Cases have already hit higher latitude areas like Maine and Canada when they weren’t projected to see such an influx until 2080, he explained. Climate change has also catered to the breeding habits of the mosquito by eliciting extreme weather, such as severe storms and dry-spells. The resulting floods and exposed water storages provide standing pools of water necessary for the A. aegypti mosquito to lay their eggs. As more of these breeding areas develop, the greater the outbreaks of mosquitoes—and dengue fever. Urbanization combined with inadequate waste management also produces litter that can trap small isolated pools of water suitable for A. aegypti’s reproductive habits. As A. aegypti mosquitoes have a strong preference to feed on people rather than animals, they usually don’t live beyond 90 meters from a human dwelling. Epstein describes reservoirs of dengue fever as non-sylvan, meaning they can’t survive in unpopulated, forested areas. After a human is bitten, it takes around a week for full-blown dengue symptoms to appear; these include high fever, headache and swollen lymph nodes, as well as eyes that are red and ache. There is also debilitating body pain in the joint and muscles, causing some people to call the disease “breakbone” fever. Usually, the immune system slowly clears the disease, causing the most severe symptoms to remain for only a few days. In some cases, the body’s immune response can actually worsen symptoms, bringing on the more infamous, hemorrhagic variety of the sickness. This severe form of the sickness rapidly uses up clotting agents from the blood. As a result, blood leaks from vessels, and purple splotches—as well as bleeding from several orifices—result. A bleeding stomach also induces cramps and vomiting of a black, grainy substance that’s similar to coffee grounds. Ironically, victims who have survived a bout of dengue fever end up being vulnerable to the hemorrhagic form. Having dealt with an initial bout, the immune system becomes all too responsive to a second attack, pushing the body to the extremes described. According to the CDC website, it’s unlikely that disease prevention and mosquito control can reverse the recent increase in epidemic activity—at least not in the near future. One reason is that a single dengue vaccine is difficult to make when four strains of the virus exist. But even with an available vaccine, the CDC states that new strains are likely to be introduced in areas where A. aegypti already thrives. Because a vaccine is still years, and possibly decades, away, Hales—for now—supports simple preventative measures that have the likeliest chance of having an immediate impact. These include improving infrastructure, encouraging solid waste disposal and increasing sanitation requirements. He also recommends improved water purification in regions that have households that must store their clean water outdoors. In countries like Vietnam, Hales noted, these basic approaches have been implemented and proven effective. In addition, Vietnamese and Australian scientists are introducing an innovative control method using a type of insect that eats mosquito larvae in water systems. Called mesocyclops, these tiny, one-eyed, shrimp-like creatures can destroy a majority of mosquitoes by consuming unhatched eggs as they lay on the still surface of bodies of water. Yet so far, such effective mosquito control is largely absent in most dengue-endemic countries. Major demographic changes that include uncontrolled urbanization and population growth, according to Hales, make efforts to stall the spread of dengue vectors exceedingly difficult. “Dengue is a good example of the negative aspects of globalization,” he observed.